A Brown Recluse Spider is placed in the same jar as a the infamous Black Widow. At first, they do not fight at all and seem content to live together with the common goal of getting out of the jar. After one week, a small beetle was placed in the jar for food. 3 days later, the Black Widow and the beetle are both dead. The Brown Recluse spider is still alive, but with only 4 of its 8 legs. In lab conditions, Brown Recluses have lived for several months on only 3 legs--hunting and feeding as normal. 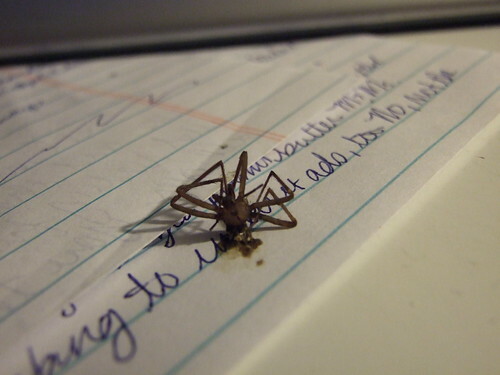 Brown Recluses can still bite up to 8 minutes with all 8 legs and even the abdomen removed. So even with only its head intact, it can still deliver a venomous bite. And then I scrolled down the page and I almost screamed at the top of my lungs. I'm warning you. It's nasty. Take a look if you dare!